WASHINGTON (CNN) -- Talk to Israeli voters, and you hear disillusionment. 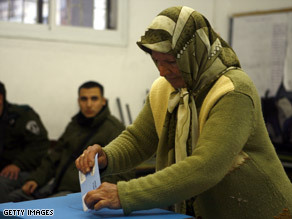 An Israeli voter casts her ballot on Tuesday. "We are the young people. We don't believe in politics," an Israeli voter told CNN. "They disappointed us, year after year." You also hear longing for an Israeli Obama. Another voter said, "Now in the United States, you have Obama, who manages to carry away the people and give hope and faith. I think that's someone that we need in Israel and is missing." Israeli candidates got the message. They tried to be like President Obama. The Kadima Party brought a truckload of young people to dance at a rally for their candidate, Tzipi Livni. Livni's slogan? "Believni." They say imitation is the sincerest form of flattery. Benjamin Netanyahu's Web site was explicitly modeled after Barack Obama's Web site. Can any candidate be Israel's Obama? Not so easily. As for Livni, she and her party are already in power. "Tzipi Livni is a fresher face," David Horovitz, editor of the Jerusalem Post, said, "but she's the foreign minister. She has been around." The far-right contender Avigdor Lieberman did create a big stir in the Israeli campaign. But Lieberman was not exactly the candidate of hope. "What you see here is despair, you see fear and you see a wave of dangerous nationalism," Ha'aretz columnist Ari Shavit said. Lieberman was more Israel's Ross Perot than Israel's Barack Obama. Israeli political analyst Chemi Shalev said, "It's a kind of protest vote against Israeli politics and against Israeli politicians." Israelis use the Hebrew word "mavrik" to describe Obama. But it doesn't mean "maverick," exactly. "'Mavrik' means 'brilliant,'" journalist Gil Hoffman explained. "Brilliant not only in the 'smart' sense of the word but also in the 'cool' sense of the word, the sense of what Israelis see Americans as, what they want America to be." Do Israelis feel confident that President Obama will be a true friend to Israel? The headline from a January 2007 Israeli tabloid newspaper read, "Worry is in Jerusalem. Obama is coming closer to the presidency." On November 5, 2008, the same newspaper had a photo of Obama on the front page with the headline, "He has a dream." Hoffman explained, "Obama came here to the town of Sderot and identified with the people of Israel. He said that if rockets were fired on his house where his two daughters were sleeping, he would do everything possible to stop it. So he has come a long way." In fact, President Obama became a bit of an issue in the Israeli campaign. Livni charged that Netanyahu would not be able to get along with Obama. Netanyahu countered by saying, "I've had a couple of really good meetings with Barack Obama. We speak the same language." Asked whether he expected a better relationship with the United States now that Obama is President, former prime minister Ehud Barak told CNN, "My experience with all presidents since President Ford is that each and every president becomes even more friendlier with Israel than we can expect." Nevertheless, Shavit noted, "There is still caution because it's not clear that it's the same kind of intimacy that Israel had, not only with Bush, but also with Clinton and other American presidents. But this is typical in any period when a new President steps in." Israelis are openly envious of the American political process that produced President Obama. As Horovitz put it, "When Israelis made comparisons with the American election, we were full of admiration and envy. We have a lousy system here." Shavit said, "There is so much apathy, there is so much disillusion, there is such lack of enthusiasm -- the political vacuum here is so deep and enormous that one can almost expect the unexpected." Israelis are certainly disillusioned with the peace process. And they are disillusioned with their leaders. Who can inspire them and be their Obama? The best bet right now is -- President Obama. After all, Israelis have fallen in love with an American president before. "Had Bill Clinton run in Israel in 2000, he would have won in a landslide,'' Shavit said. Clinton and Israeli prime minister Yitzhak Rabin were icons of the Israeli peace movement. "Rabin and Clinton were our Kennedys in many ways," Shavit added. "To this day, Clinton is Israel's love." With President Obama, Israelis are hoping to fall in love again.